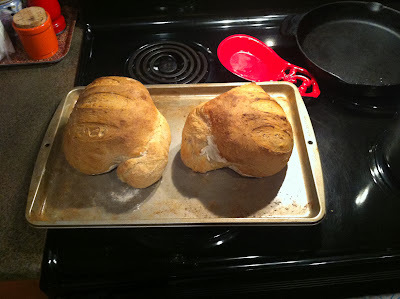 Emboldened by our recent home-cooking successes, I decided to try my hand at baking a yeast bread. Now, I’m a huge fan of down-to-earth old fashioned European crusty bread, so that’s what I set out to find. I ended up choosing this recipe, not really paying attention to how many steps it was and how long the preparation takes. This bread basically needs a day and a half of your time to make. The pre-ferment went pretty smoothly. I had all the ingredients, and this part went smoothly. I substituted active dry yeast instead of instant yeast, but some confusing and inconsistent internet searching eventually convinced me that I would be fine with equal or slightly generous measures. Basically you just combine all the ingredients in a bowl, and then let it sit overnight. I put it in the fridge the following morning, as I wasn’t going to be able to bake until the evening, and that’s what the recipe says to do if you go beyond 16 hours between stages. It was after I was already grabbing ingredients and getting ready to go that I noticed that it called for a portion of whole-wheat flour. Lacking that, I just did a whole pounds of bread flour again. You are instructed to mix up all the ingredients except the pre-ferment, which I did. There were no comments about what the mixture was to look like, but I clearly used too much water. I carried on, however, not realizing that I had just made batter instead of dough. The next step is to chop the pre-ferment into small pieces and use a mixer to knead the two doughs together. This is supposed to be a difficult process, which leaves visible streaks of color where the two doughs don’t combine fully. My over-saturated batter just swallowed the pre-ferment right up. When I was trying to transfer it to a bowl to rise again I was finally forced to concede that my dough was too wet and added more flour until it was more or less handleable. The dough was then allowed to rise for another few hours, with a punch or two to control the air bubbles. I ended up letting it rise for an hour longer than I was supposed to, and I decided to skip the hour of resting after shaping the (still sticky) dough into loaves. So into the 450 degree oven they went! The recipe suggests that it should take around 30 minutes to bake, but I needed more like an hour before the center was done at 200 degrees. 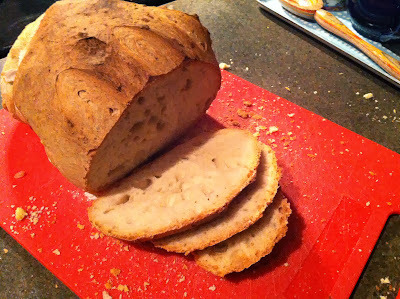 The bread turned out weirdly misshapen and slightly chewy, but it is dense, crusty and delicious. I’ll call this a qualified success, and will probably go with a simpler recipe next time. This entry was posted on Tuesday, November 5th, 2013 at 12:11 am	and is filed under Cooking. You can follow any responses to this entry through the RSS 2.0 feed. Both comments and pings are currently closed.